Joy has sent an update on Project Linus for the West Midlands region. 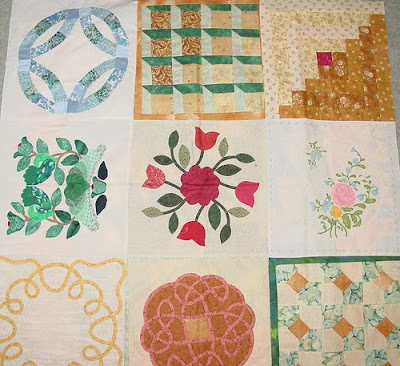 Aside from an update on the phenomenal number of quilts that have been completed, there are some lovely stories about some of the quilters behind the quilts. 119,676 quilts delivered across the UK since 2000, 5,320 quilts delivered across the UK so far in 2010, 2,197 delivered by me in the West Midlands since 2004. Thank you from all the children. Summer has arrived and with it some lovely hot sunny weather. Off to Devon for a couple of days later in the month so hoping it stays this way for a while. As you can see from the numbers above there is a steady supply of quilts being made. I have spoken to many of you over the past weeks and know that you are all enjoying being part of what we do. I have just written an update for the Patchwork and Quilting magazine so keep an eye out for it in case it gets published. I have now made a couple of deliveries to the Birmingham Childrens Hospital and also to Mencap as well as Acorns Hospice, Barnados, Edwards Trust, Charles House, Queen Elizabeth Neo-natal unit and Hearlands Hospital. I had the pleasure of being invited to the Mencap Pirates day to see the quilts being given to a group of children. They each chose their own quilt (with a bit of help from mom) and the smiles on their faces were so big it was lovely to see. One young girl uses a wheel chair and has severe cataracts – to the extent that she can hardly see at all now. 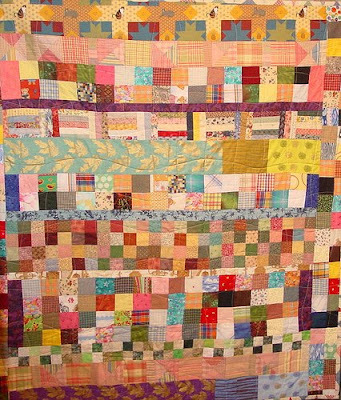 The quilt chosen for her had been made using thick ‘puffy’ wadding and as a result there were lots of grooves where the quilting was. Although she couldn’t see it clearly she could feel the different textures and shapes as her hand ran over it. Her face simply lit up and both the mother and the care worked made a point of coming to tell me how good it was to see her react in this way as it was becoming more difficult to engage with her. Many of you make a quilt or two each year and these are really appreciated. I know first hand how difficult it can be to fit everything in and every single quilt really does make a difference. Some are brought to me, some posted, some left at Cotton Patch and some handed over when I visit quilt groups. This time I wanted to give you an insight in one or two of the special people that I meet who really dig deep and get involved – right up to the hilt! Firstly over the past couple of years I have taught my daughter in law Jacqui how to 'do' patchwork and quilting as she wanted to be involved and she's now made over 150 quilts. I took her to Malvern for the first time this year and she was amazed. She also demanded to know why I hadn’t told her before about all the other lovely fabrics, techniques etc that were there! Sue is the cutting queen. She has generously spent a lot of time cutting blocks square and cutting fabric offcuts into strips and squares ready for use. All this despite holding down a job and running a quilt group in Halesowen. I often get home to find that Joy from Barnt Green has left a little parcel of quilts in the back garden bin and a note through the front door to make sure I retrieve them. Glenys from Wednesbury makes lovely pastel coloured quilts and regularly rings me up to say she has a batch of 15 to 20 quilts ready for collection. As she lives close to Ikea it is a perfect opportunity for me to pop in and have a browse along the way. Jane from Leicester found herself in a position where she desperately needed a purpose in life so contacted me. She had used all of her fabric stash (horror of horrors) and wondered whether I could let her have a few bits to do. I sped to the rescue taking her a HUGE bag of blocks and fabric pieces, wadding etc. 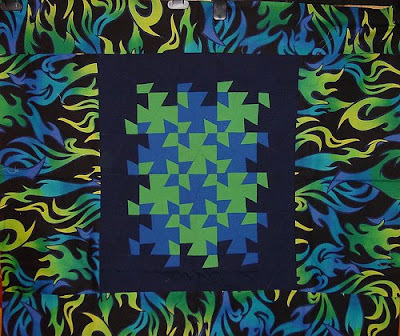 Despite dealing with difficult health issues Jane has become a real stalwart of the Quilt Block Orphanage and over the last 6 months has produced 60 quilts! Jane lives close to the Fabric Guild (Kisko) so again I have a perfect excuse to go along and snap up some goodies along the way. For those of you interested in the progress of the Quilt Block Orphanage (QBO) I have now received 4,307 orphan blocks and to date 308 quilts have been completed with more in various stages of construction. To see photos of the quilts go to the website – see address below or click this link. Well it just remains for me to wish you all a very happy summer – look out for sun burn – and say I look forward to receiving lots more lovely quilts in the coming months. Don’t forget, if you belong to a quilt group please share this and help spread the word. By the way if anyone has any 100% wool blankets/picnic rugs that they don’t want I’d love to receive them Any size is fine and it doesn’t matter if they have a hole or two as they’ll be cut up!! Plain beige or tartan - /anything goes. I’ll tell you more next time. Festival of Quilts - Coming Soon!